A Q&A with Dr. Scott Runnels, featured in the October 2010 issue of Metro Christian Living. 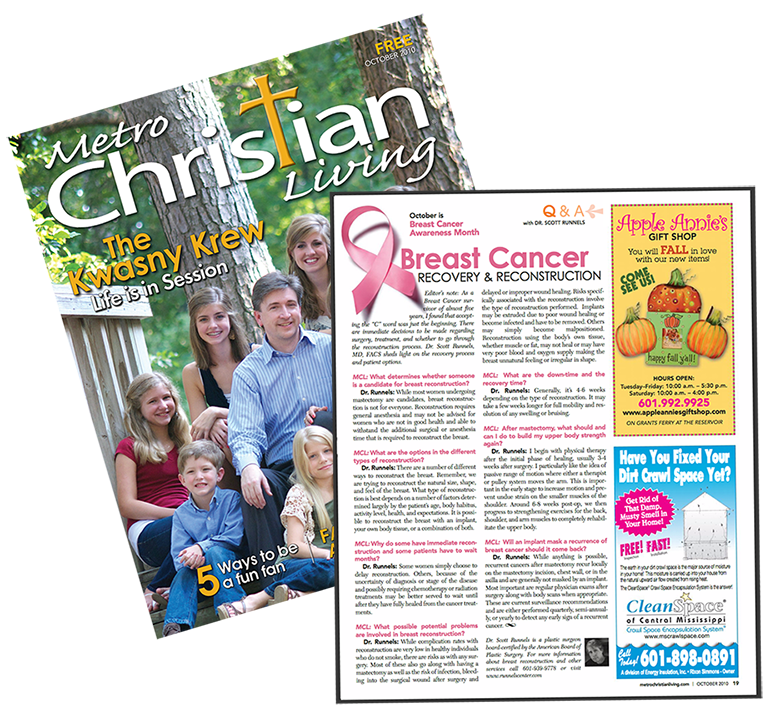 Metro Christian Living: What determines whether someone is a candidate for breast reconstruction? Dr. Runnels: While most women undergoing mastectomy are candidates, breast reconstruction is not for everyone. Reconstruction requires general anesthesia and may not be advised for women who are not in good health and able to withstand the additional surgical or anesthesia time that is required to reconstruct the breast. MCL: What are the options in the different types of reconstruction? Dr. Runnels: There are a number of different ways to reconstruct the breast. Remember, we are trying to reconstruct the natural size, shape, and feel of the breast. What type of reconstruction is best depends on a number of factors determined largely by the patient’s age, body habitus, activity level, health, and expectations. It is possible to reconstruct the breast with an implant, your own body tissue, or a combination of both. MCL: Why do some have immediate reconstruction and some patients have to wait months? Dr. Runnels: Some women simply choose to delay reconstruction. Others, because of the uncertainty of diagnosis or stage of the disease and possibly requiring chemotherapy or radiation treatments may be better served to wait until after they have fully healed from the cancer treatments. MCL: What possible potential problems are involved in breast reconstruction? Dr. Runnels: While complication rates with reconstruction are very low in healthy individuals who do not smoke, there are risks as with any surgery. Most of these also go along with having a mastectomy as well as the risk of infection, bleeding into the surgical wound after surgery and delayed or improper wound healing. Risks specifically associated with the reconstruction involve the type of reconstruction performed. Implants may be extruded due to poor wound healing or become infected and have to be removed. Others may simply become malpositioned. Reconstruction using the body’s own tissue, whether muscle or fat, may not heal or may have very poor blood and oxygen supply making the breast unnatural feeling or irregular in shape. MCL: What are the down-time and the recovery time? Dr. Runnels: Generally, it’s 4-6 weeks depending on the type of reconstruction. It may take a few weeks longer for full mobility and resolution of any swelling or bruising. MCL: After mastectomy, what should and can I do to build my upper body strength again? Dr. Runnels: I begin with physical therapy after the initial phase of healing, usually 3-4 weeks after surgery. I particularly like the idea of passive range of motion where either a therapist or pulley system moves the arm. This is important in the early stage to increase motion and prevent undue strain on the smaller muscles of the shoulder. Around 6-8 weeks post-op, we then progress to strengthening exercises for the back, shoulder, and arm muscles to completely rehabilitate the upper body. MCL: Will an implant mask a recurrence of breast cancer should it come back? Dr. Runnels: While anything is possible, recurrent cancers after mastectomy recur locally on the mastectomy incision, chest wall, or in the axilla and are generally not masked by an implant. Most important are regular physician exams after surgery along with body scans when appropriate. These are current surveillance recommendations and are either performed quarterly, semi-annually, or yearly to detect any early sign of a recurrent cancer. Dr. Scott Runnels is a plastic surgeon board-certified by the American Board of Plastic Surgery. For more information about breast reconstruction and other services call 601-939-9778 or visit www.runnelscenter.com.